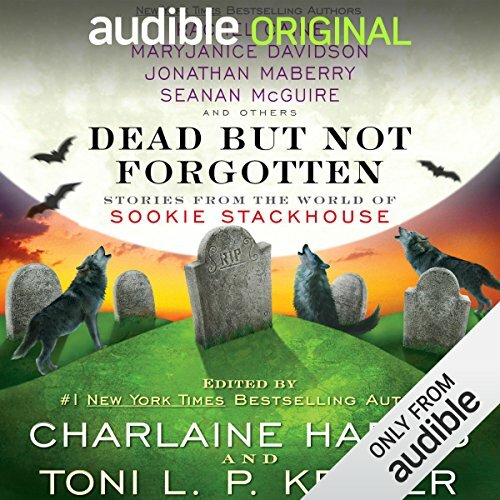 Dead but Not Forgotten was edited by Charlaine Harris and Toni L.P. Kelner. ©2014 Charlaine Harris, Inc. (P)2014 Audible, Inc. This collection of stories are a little of old home, the writers kept the feel and taste of CH's books. I give a big "Well Done" to each of them. They also made a wonderful choice by keeping Johanna Parker as the narrater. Again, "Well Done". I have loved and still love the Sookie books and I mourn the end of the series. I find this book bitter because It's the last of a great thing, I find it sweet becouse it gave me one last taste of a wonderful series. So, if you loved and enjoyed the Sookie books as I have, this is a must buy. Great return to BonTomps and Sookie's world. I have read and enjoyed all the Sookie Stackhouse books and miss not having new ones, so this was a great return to that world. Johanna Parker did a fantastic job reading each of the short stories and I feel made the return trip 100%, because you could feel you were back in Sookie's world hearing her voice. Thank you for this treat. Entertaining stories of "Dead" characters outside their interaction with Sookie. What was one of the most memorable moments of Dead but Not Forgotten? Quinn's story was riveting. I wanted more! What three words best describe Johanna Parker’s performance? No, movies never do justice to the images created in my head. When I re-listen to the Sookie books, the "Not Forgotten" stories will add more color to the way I envision these characters. Awesome addition to Sookie's world! This awesome lineup was the most entertaining 12 Hours and 36 Minutes I have ever purchased! I absolutely loved the stories all the writers came up with from the Sookie Stackhouse world! I wasn't sure what to expect when I started listening to this audiobook, but couldn't imagine it being all that bad because it's about Sookie, and Charlaine put her stamp of approval on it. While listening to the extreme care the writers put into the details and dialogue of the stories, I fell in love all over again with Sookie's world. I miss them so much, and for Leigh Perry to show us Sookie and Sam's future after the last book with their children was so heartwarming. The Real Santa Claus was my most favorite, thank you Leigh Perry! The Bat Signal by Suzanne McLeod was runner up featuring little mind reader Hunter, Sookie's cousin. I can pretty much guarantee any Sookie fan that you will love this work of art as much as I have! Johanna Parker has been the voice of Sookie through all the books in the series as well as the short stories. I totally love her Louisiana Sookie accent! Johanna does such a wonderful job with all the characters voices, and just pulls you into the story as if it were Sookie herself! Great job with the whole series Johanna, I give you 5 Fangs for your wonderful performance! I wish Ms. Harris had better material from the writers and stories she chose. When the Sookie Stackhouse series was turned into the HBO hit "True Blood ; suddenly almost every fan of the books and the show thought they were accomplished writers..... and then came thousands of made up stories using her characters: fan fiction...... UGH! i thought most of them were no better than some teenager's wish list. sorry, but the stories in this book reminded me of them. Especially the last two in the book. Pam's turning and Eric's ennui were so boring i could barely finish the book. Alcide's story made little sense to me. And not one story from the point of view of the lead male, Bill Compton, or the lead female, Sookie Stackhouse. I was disappointed in nearly every single story. I don't recommend it to any fan unless you can borrow it from a friend for a free reading. Dead But Not Forgotten At All! If you could sum up Dead but Not Forgotten in three words, what would they be? Diantha - her take on who Santa really is is awesome! Which character – as performed by Johanna Parker – was your favorite? Pam. She had the snark down pat! And what a treat this book is. Now I know a lot of fans are pissy at how Charlaine Harris ended the Southern Vampire Mysteries series - so much so that my review of the final book, Dead Ever After, is still one of my largest viewed reviews on this blog - but please, please, PLEASE give this book a chance! Dead But Not Forgotten is written entirely by authors other than Charlaine Harris. Yes, Harris has edited the novel, but the work is still each author's creation. And what a delicious blend there is. Not only do we get to see the world through the eyes of some of the big players in Sookie Stackhouse's world; Alcide, Eric Northman, Pam - but we get welcomed into the lives of the smaller players too - and this is where the magic occurs. While I was excited to see stories dedicated to Eric and Pam, it was the stories of Bubba, Diantha, Kevin & Kenya and Bev & Todd that really made my day. Each story is fantastically written as well as woven seductively around the other main characters in Bon Temps and Shreveport. I love the Sookie Stackhouse series and its characters. Although these stories weren't written by Charlaine Harris, I loved hearing what these characters might be up to and the interpretations of other authors. Where does Dead but Not Forgotten rank among all the audiobooks you’ve listened to so far? I loved hearing stories from all the different characters! I really REALLY hope there are more of these in the future! Do I really have to pick just one?! Hmm... maybe the Eric story? Pam's story was great! Or maybe Diantha? I also really like Alcide's story. I just can't choose! If you loved the Sookie books then purchase this! You won't be sorry! I like that a lot of the secondary characters were given a story of their own ( Dianta, Quinn, Eric, etc) now we need a sequel on the sequel. What does Johanna Parker bring to the story that you wouldn’t experience if you just read the book? She brought life to the story and she brings life to the sequel. The one with Dianta made me laugh and Eric's made me happy. This was a very good series and another sequel would be great. I liked it. . . I was on the fence when this book came out but in the end, the fact that Johanna Parker was narrating and because some of the contributors are some of my favorite authors, I decided to give it a whirl. I'm glad I did. Let me point out that none of the stories are written by Charlaine Harris, so if they don't "sound" like her, it's because she didn't write them. They do, in my opinion, get pretty close. Also, Sookie only makes a brief cameo in a few of the stories. The stories are about other characters, some well known, some not so much. I'm a pretty big fan of the Sookie books and I really liked getting to see some of the other characters in a different light. Parker did a good job, I'm glad she read this one, it wouldn't be a Sookie book without her.